Minimal sabino and rabicano half-Arabian filly with a wavy blaze, matching hind socks, right front half-sock. Bella has beauty, soundness, color, and a fabulous temperament. She has a well laid-back shoulder and powerful hip, with an elegant neck and strong topline. 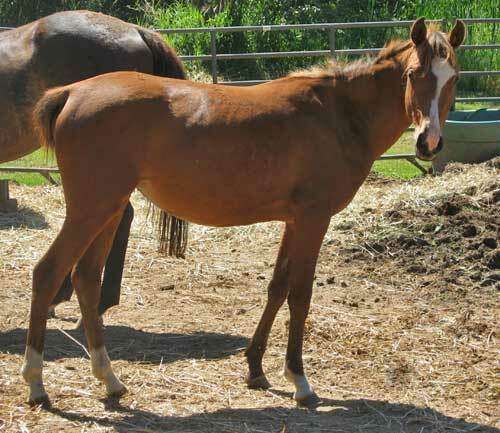 This filly can pick up and move like an endurance horse, then float like a dressage prospect. This is the sort of filly you’ll be able to show in-hand, take almost anywhere under saddle, and then breed her for outstanding foals. 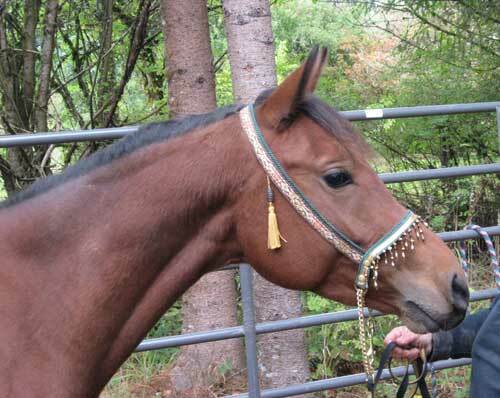 The Half-Arabian Sport Horse In-hand classes would be a natural for her. With her curious, friendly temperament, Bella has the intelligence to learn anything you want to teach her. While she was hand-raised from three days old and is very people-focused, she is respectful and doesn’t nip or push. 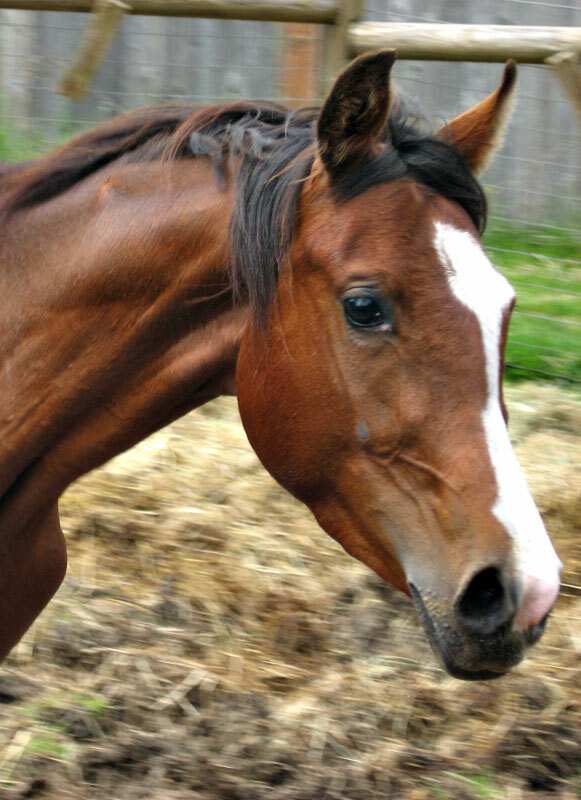 She has lived with an ‘aunt’ or ‘sister’ from foalhood, and is not confused about whether she is an equine or a person. Click here for more information on Rio, Bella's sire. 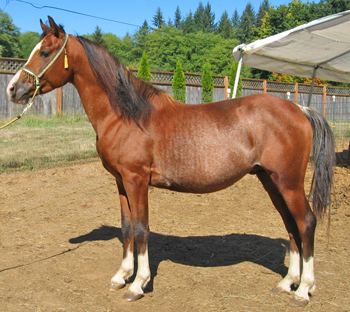 Bella’s sire is Apacheblu Radyance, carrying the Arabian sabino, rabicano, and blue-eyed genes, and may carry the splash and silver bay genes, and now training in endurance riding. Rio is intelligent, willing, and possesses powerful dressage movement and suspension. Mostly CMK on top, he carries champions like Merlann, Galan, Muhuli and Abu Farwa. The dam side carries Huckleberry Bey, Elimar, and Celebes; this pirate is performance bred! 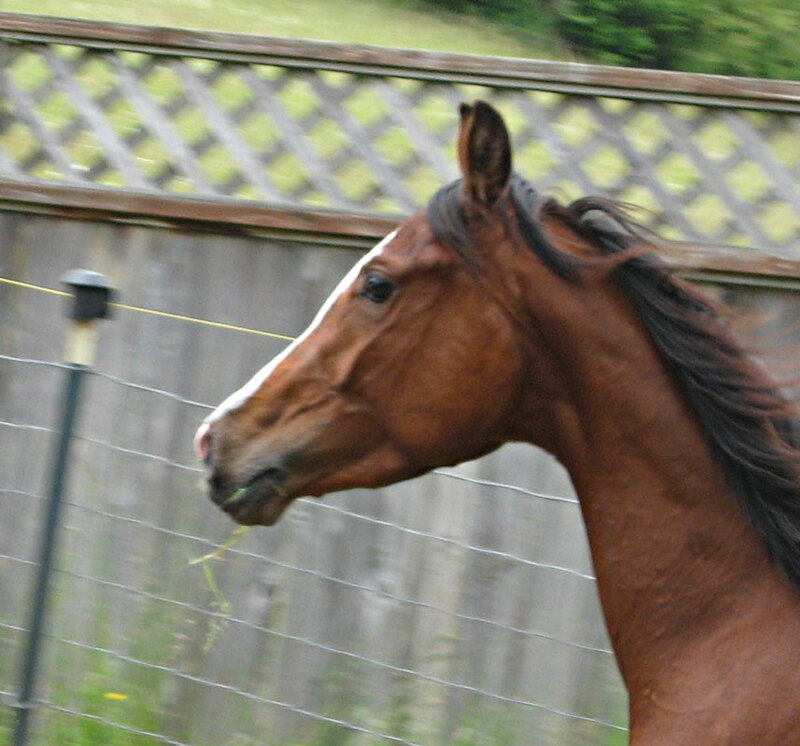 Click here for more information on Feather, Bella's dam. Bella’s dam is Noble PlayFeathers, a bay half-Arabian, who is just as wonderful as her name implies. Feather is a beautiful blood bay daughter of Regional Champion, Playmaker+. Want English and Park trot? Feather has got it through MHR Nobility, Celebes, Custom Delux+, Gdansk+ and Bask++ on top and bottom. Through her Saddlebred lines, she has two crosses to the pinto Reserve Grand Champion, Modern Creation. Learn more about Noble PlayFeathers here. New! AVAILABLE: $500. Terms available.